With no important economic reports in Switzerland, GBPCHF is chiefly under the influence of CBI Trends – Orders. GBPCHF is moving in higher ranges today and there is good chance of hitting 1.4440 soon. 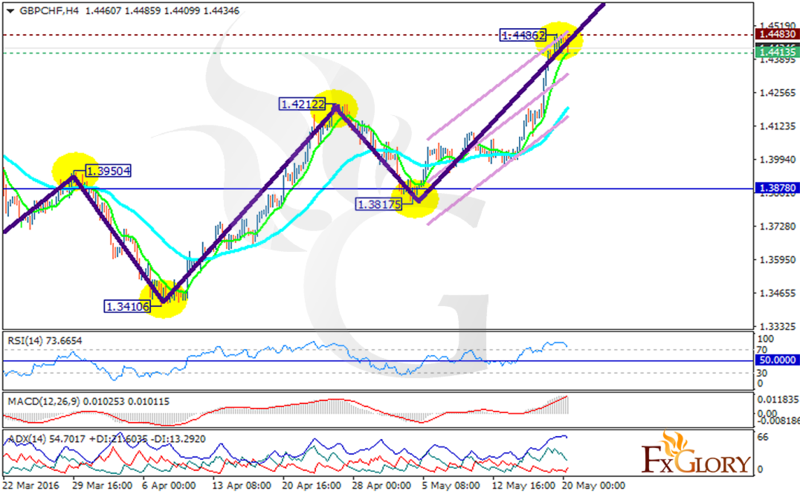 The support rests at 1.44135 with resistance at 1.44830 which both lines are above the monthly pivot point at 1.38780. All indicators are showing strong buy signal, the RSI is above the 50 level, the MACD indicator is in positive territory and the ADX is confirming the bullish scenario by suggesting stronger buyers than sellers. The EMA of 10 is sharply moving up above the EMA of 50 showing price growth in the last 10 days. Long positions are recommended with the target at 1.4490 however there would be a pullback after this hit.